Pyroclastic flows are fluidized masses of rock fragments and gases that move rapidly in response to gravity. Pyroclastic flows can form in several different ways. They can form when an eruption column collapses, or as the result of gravitational collapse or explosion on a lava dome or lava flow (Francis, 1993 and Scott, 1989). These flows are more dense than pyroclastic surges and can contain as much as 80 % unconsolidated material. 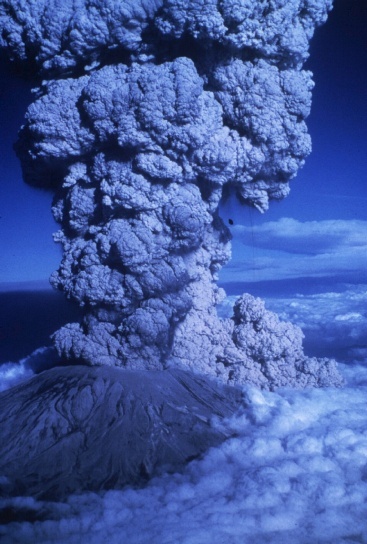 The flow is fluidized because it contains water and gas from the eruption, water vapor from melted snow and ice, and air from the flow overriding air as it moves downslope (Scott, 1989). The image on the right shows the formation of pyroclastic flows during a 1980 eruption of Mount St. Helens (photo courtesy of J.M. Vallance). Ignimbrites and nuees ardentes are two types of pyroclastic flows. An ignimbite contains mostly vesiculated material whereas a nuee ardente contains denser material (Francis, 1993). Nuee ardente means glowing cloud and was named for the pyroclastic flows seen at Mount Pelee. These flows were often accompanied by a cloud of ash elutriated from the flow. When the incadescent ash particles are observed at night, the flow looks like a glowing cloud moving away from the volcano. Pyroclastic flows can move very fast. Small pyroclastic flows can move as fast as 10 to 30 m/s while larger flows can move at rates of 200 m/s (Bryant, 1991). Nuees ardentes have been known to extend 50 kilometers from their source and Ignimbrites, because of the lighter weight material that they carry, can extend 200 km from their source (Bryant, 1991 and Scott, 1989). At Mount Pinatubo in the Philipines, pyroclastic flow deposits were 220 m thick in some valleys but averaged 30 to 50 m thick in others (Wolfe, 1992). Pyroclastic flows have been known to top ridges 1000 m high (Bryant, 1991). 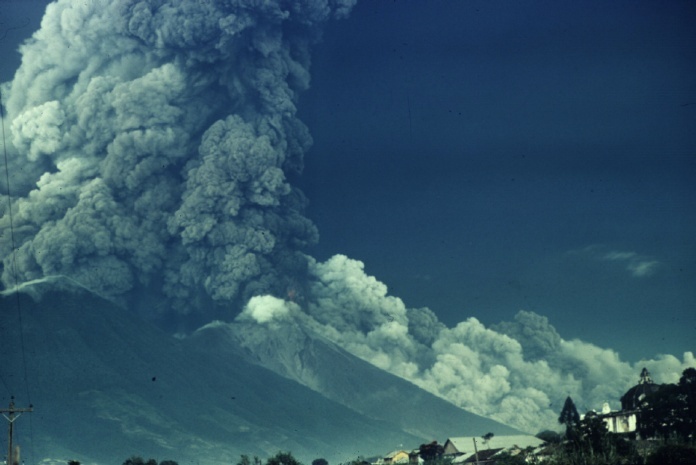 The image on the left shows a pyroclastic flow descending Fuego Volcano in Guatemala (photo by W.C. Buell IV, 1974). Click here for a movie of a pyroclastic flow at Mount Pinatubo (movie courtesy of M.T. Dolan). Pyroclastic flows can be very hot. In fact, pyroclastic flows from Mount Pelee had temperatures as high as 1075 degrees C (Bryant, 1991)! Some Pyroclastic flows from Pinatubo had temperatures of 750 degrees C and pyroclastic flows from Mount St. Helens had temperatures of 350 degrees C ( Bryant, 1991). Such high temperature flows can burn manmade structures, vegetation, and, for those unlikely enough to be caught by then, human skin. This is an image of a pyroclastic flow deposit from Mount St. Helens, August 1980. Pyroclastic flows and lahars are the greatest volcanic hazards. More people have died due to these hazards than any other volcanic hazard (Chester, 1993). Pyroclastic flows can incinerate, burn, and asphyxiate people. Gases within a pyroclastic flow can explode and cause ash to rain down on nearby areas as shown in this image near Mount Pinatubo in the Philippines (photo by M.T. Dolan). 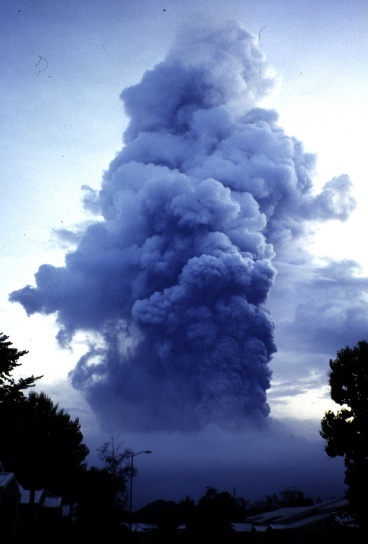 Pyroclastic flows travel long distances so their threat is far reaching. What is worse is they also can transform into lahars which travel even farther distances from the volcano and can produce even greater hazards. Scientists recognize the hazards of pyroclastic flows, and so there is currently a lot of research going on in this area. Important research with regard to hazards prevention is the study of past pyroclastic flow deposits. Areas that have old pyroclastic flow deposits are likely to receive new pyroclastic flow deposits if the volcano erupts again. People living near the summit of an active volcano, especially those in valley areas, are most likely to be in danger from a pyroclastic flow. The best course of action for these people to take when a volcano erupts is to evacuate valley areas and head for higher ground away from the volcano. Of course, if the volcano gives ample warning that it is going to erupt, then the best thing to do is evacuate the area and get as far away from the volcano as possible.